A new feature: "The Caption" is new to The Bust (probably for good reason). We'll include the caption that would have appeared if the photo had run in a newspaper. Only the worst baseball card photos will get The Caption treatment. Feel free to leave your own caption as a comment to show everyone how much funnier you are than the dimwits at The Bust. The Caption: "Dave Winfield, above, takes a crap in the New York dugout Wednesday during the Yankees' 4-2 loss to the California Angels in Anaheim, Calif. Winfield went 0-for-4. 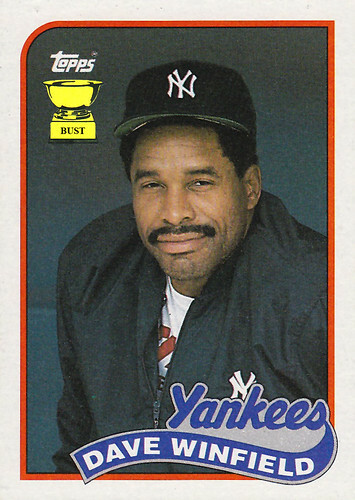 "He stunk today," Yankees first baseman Don Mattingly said of Winfield after the game."